Make Your Own Play Dough! 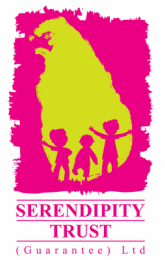 The Serendipity Trust coordinates the 'Art & Play Therapy' Programme at Sambodhi Home for the Disabled. This programme offers regular creative arts sessions for approximately 40 residents who have a diverse range of conditions such as cerebral palsy, downs syndrome, traumatic brain injury and autism. This programme provides a vital socialization, recreation and creative outlet for residents. The Serendipity Trust coordinated a Mural Project at Sambodhi Home led by mural artist Rose Abeywickrama. A big thank you to the teams who participated in the Lakderana Tuk Tuk Polo Tournament 2016 for their generous donation to support this mural and arts programme. Sambodhi Home for the Disabled cares for 47 individuals ranging in age from 7 to 75 near Galle on the southern coast of Sri Lanka. The residents here experience physical and or intellectual disability. Founded in 1964, Sambodhi Home is a private home which largely depends on the generosity of the local and visiting community. Stay tuned for regular updates! Email info@serendipitytrust.com for more information or if you would like to support this important initiative.